In the morning, we will come to collect you at Tien Sa port and then we begin our hoi an private tour from Tien Sa port. On arrival, we then stroll around this lovely peaceful town and visit Fukien temple – the most typical Chinese architecture. The temple was built by Fukien community who lived in Hoi An and for them to come to honor their forefathers. Besides, lots of Chinese people came to pray to Goddess of the Seas in the old days. 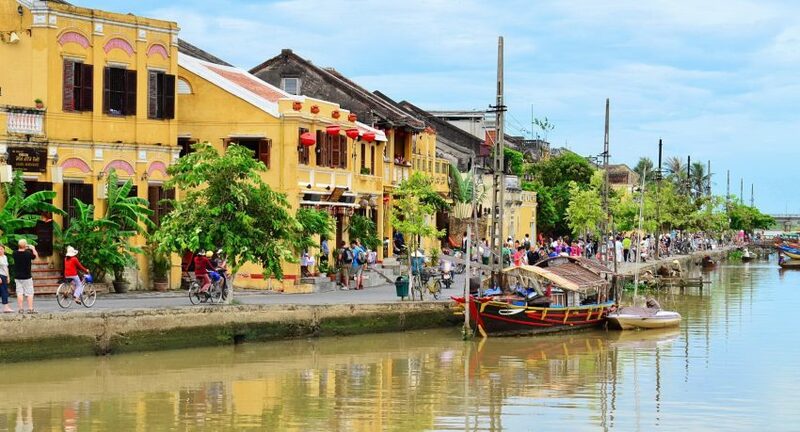 Nowadays, this spot becomes a sacred site for Hoi An people to come and worship for their best wishes. Following that, we are then off to Tan Ky ancient house which has the combination of Chinese, Vietnamese and Japanese architectures. This house is kind of tube home in Hoi An with 3 separate apartments: the front, the middle and the back. In the old times, people had to collect the goods from merchant boats in the rear and sold out in the front. Entering inside the house and listen to the host telling you the history of the place. In months of October, November, December, January, February; it normally rains in Hoi An, let’s bring rain coats with you. For the rest of the year, it is usually hot and humid. Marble Mountains have lots of stairs. Please bring the suitable shoes. Tour departs from Dong Hoi city and Hue city only and is conducted in a nice sunny pleasant day. We will not organize the tour in case of bad weather.